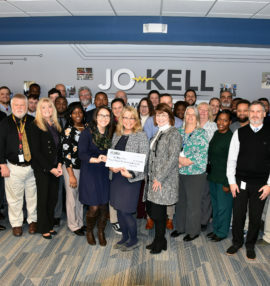 Home - Jo-Kell Inc. :Jo-Kell Inc.
For over 40 years, Jo-Kell, a woman-owned small business, has been an electrical distributor and solutions provider serving the military, commercial marine, and industrial markets. Jo-Kell was established in 1977 by Joseph A. Kelly. Today the company is owned and operated by Suzy Kelly, CEO, and Marty Kelly, President. The main office is located in Chesapeake, VA, with regional offices in Richmond, VA, Jacksonville, FL, Atlanta, GA, and San Diego, CA. Providing the PowerChain Management solutions to your power system need! Leading supplier of integrated products, services and support to the U.S. military. Design, manufacture and market products for customers in multiple industries. Delivering a simple and cost-effective solution for topside conduit and fitting assemblies. The best in maritime products, services and integrated multi-use systems. Providing marine, offshore and industrial lighting innovative product solutions. © JoKell Inc. All rights reserved. Website creation & maintenance by Bull & Company MediaWorks.